There was a time, not very long ago, that FC St. Pauli’s North American presence consisted of one solitary, vibrant supporters club in New York City – Brooklyn to be exact. The East River Pirates, after their beginnings in 2008, shared the continent with pockets of supporters in Atlanta and Indianapolis. But in very recent years NYC has been joined by a number of other North American supporters clubs, all with a thirst for FCSP football, politics and that sense of community like no other. 2016 saw the addition of the first Canadian club in Toronto, followed by more clubs in 2017 in Calgary and Buffalo. An English language podcast Fell in Love With A Girl also emerged in Calgary, giving a unique perspective on FCSP matches and other happenings. Something was happening. People were craving an alternative to modern football. The political landscape had shifted radically to the right in America and the inclusive ethos of FC St. Pauli was needed more than ever. And then the unthinkable, impossible happened. FCSP Goes USA. 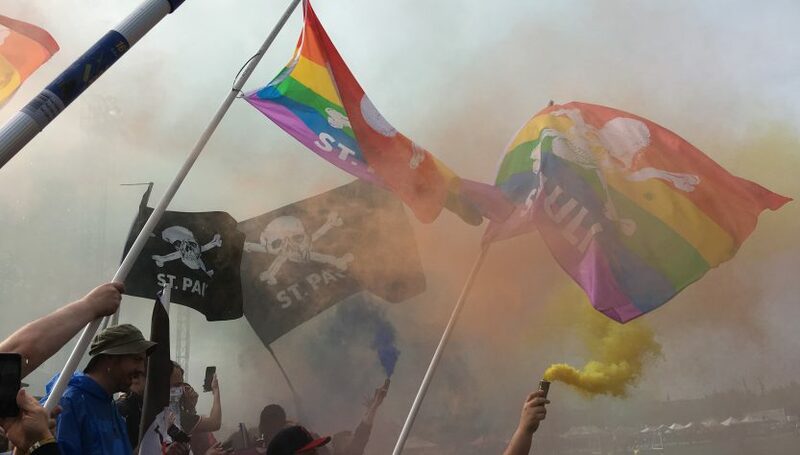 FCSP came to Detroit and Portland in May 2018 for a tour of the U.S. including concerts, meet and greets, and of course two historic friendlies. The tour exposed a whole new legion of fans to the Boys in Brown up close and personal. News of FCSP Goes USA happening spawned a new supporter club in Detroit and after the tour Ottawa, Ohio, Arizona and Montreal joined the fold. NordAmerikurve is one of the voices for this motley collection of clubs. We exist to help share the FCSP experience with North Americans. We do this through social media, match viewings and helping fledgling clubs take flight. We also want to make change on the ground. Each club is working to spread the FCSP messages against racism, fascism, sexism, homophobia and hate. We’re also trying to help local charities that are also making a difference. We want you to join us. Whether it’s at a match viewing or by setting up a club in your own city/region. Let’s help spread the FCSP love.